Ilika’s Stereax® technology is the first solid state battery bridging the gap between the IoT space and Electric Vehicles. The Stereax® IP technology offers compelling advantages over conventional lithium ion batteries, including: smaller footprint for IoT sensors, energy dense large format EV cells, faster charging, longer life span, low leakage and reduced flammability . The Ilika Stereax® roadmap focuses on four main battery requirements: miniaturisation, capacity in a small footprint, increased performance and high capacity for EVs. The miniaturization roadmap (M250, M50) looks at increasingly smaller footprints and smaller currents (μA), making them ideal for small sensor driven devices developed in MedTech. The capacity roadmap (high-energy) increases the amount of energy for a given active footprint by utilizing Ilika’s patented stacking feature, which allows multiple cells to be stacked on top of one another. The performance roadmap (P180) focuses on higher energy density solutions that have additional requirements such as extended temperature range support for applications in Industrial IOT. 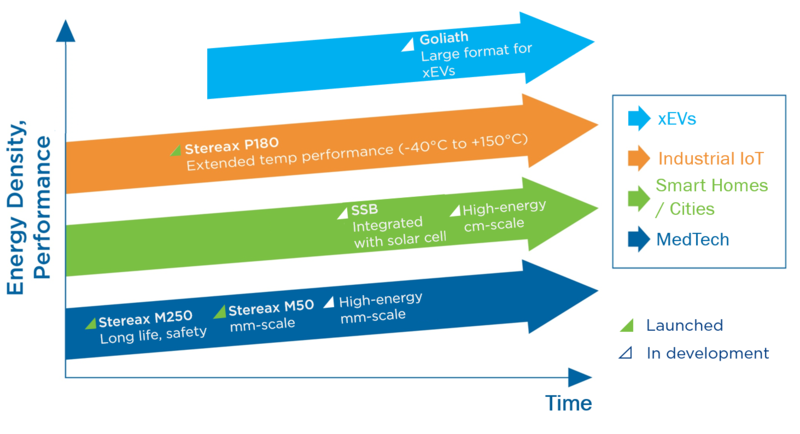 The large format roadmap (Goliath) develops energy dense, safe cells for electric vehicles and stationary power.